"I believe humans get a lot done, not because we're smart, but because we have thumbs so we can make coffee". 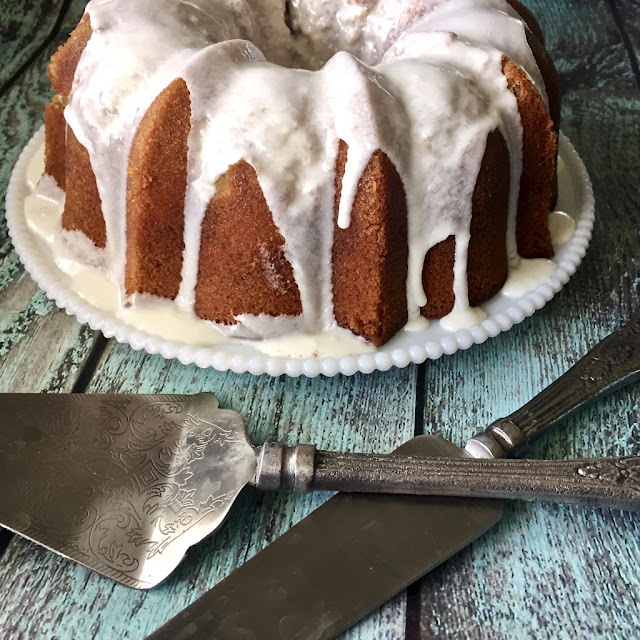 Those thumbs also help us make delicious cakes like this coffee and cream bundt. This month the Bundt Bakers are baking Marbled Bundts. In getting ready to bake my bundt I almost made the ultimate mistake that would have excluded me from joining in this month - for some reason I thought we were baking coffee bundts, and it was only by luck that I decided to marble my bundt by doing a zebra pattern. What a relief. I based this bundt on my previous Neapolitan Zebra Bundt Cake. As previously mentioned in that post once you have completed your mise en place this bundt is really easy to put together. It is a little different to the usual cream the butter and sugar, as the butter is actually melted and cooled and then beaten with the sugar. Whipping cream is then added and after it is beaten it is quite light and fluffy, and almost pudding-like. The pattern is quite easy to achieve as well, even though it looks quite intricate. 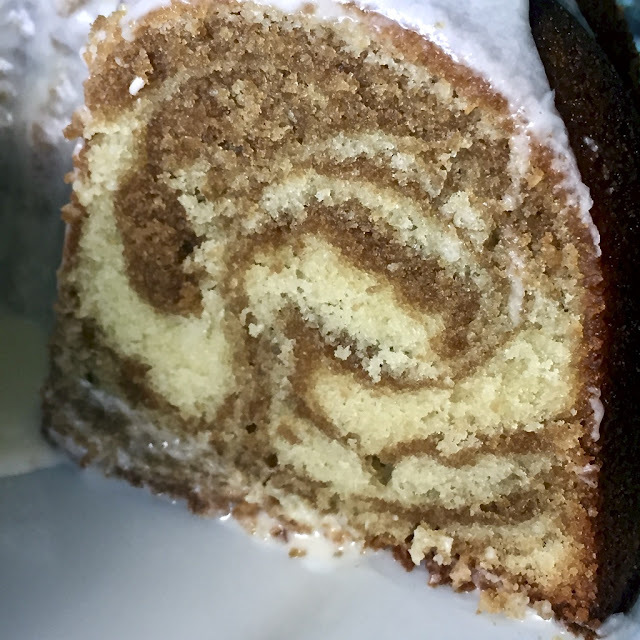 I will say that the pattern in this bundt was not quite as effective as other "zebra" cakes I have done, but it was certainly delicious. The only problem I had with the bundt was that it stuck slightly when I was trying to get it out of the pan. This is only the second time that this has happened to me, and I suspect it was the espresso that actually caused it. I did spray quite liberally but next time I will definitely coat it extra-well. 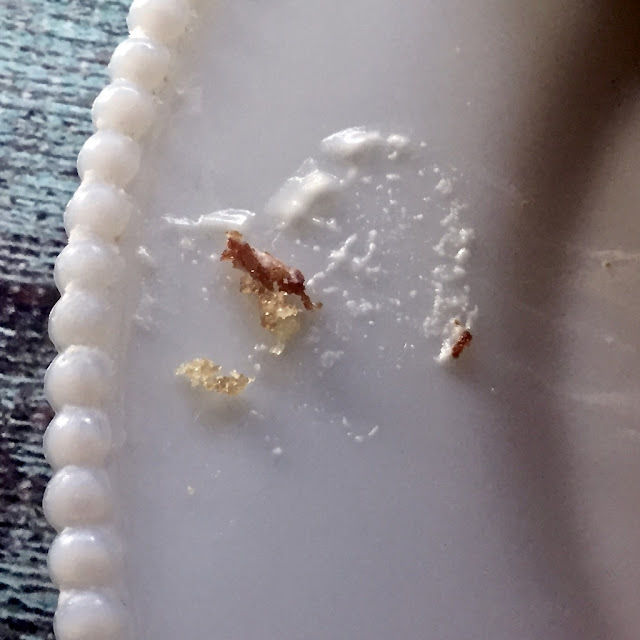 Fortunately the pieces that stuck came out in one piece so I was able to place them back on the cake, and then turned to that magical item that covers all mistakes - icing! 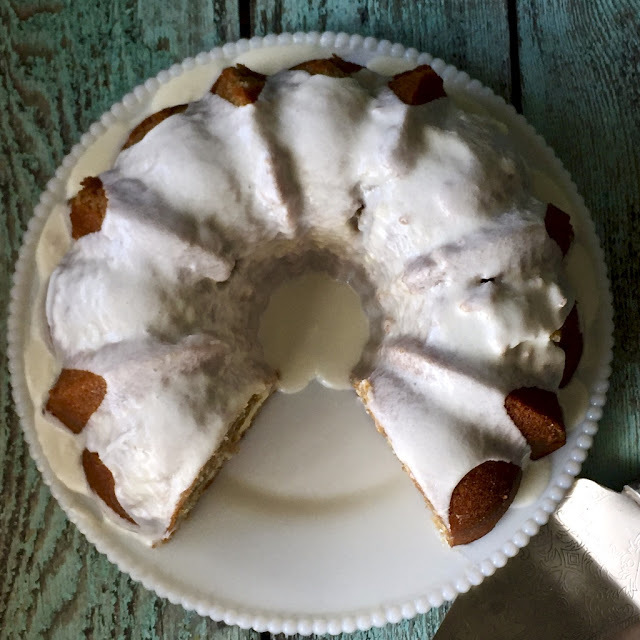 I combined powdered sugar and some whipping cream and poured it over the bundt and you would never know at one stage there was part of the cake missing. 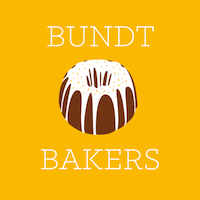 If you would like to know more about #BundtBakers and see what the other bakers made for our Marbled Bundts theme please scroll down below the recipe. In a small bowl add the espresso powder and hot water and mix until the powder is dissolved. 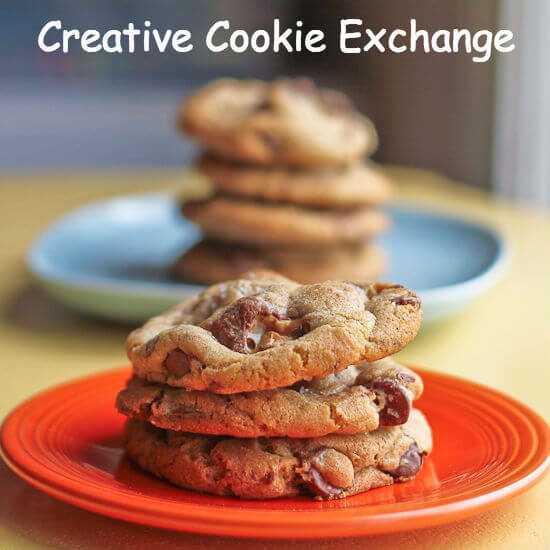 In a medium bowl add flour, baking powder, and salt and whisk to combine; set aside. Add whipping cream to bowl and mix on medium for about 2 minutes until well combined and light. In one bowl add the espresso liquid and mix until well combined. Using a medium-sized ice cream scoop, drop a scoopful of vanilla batter into prepared bundt pan. 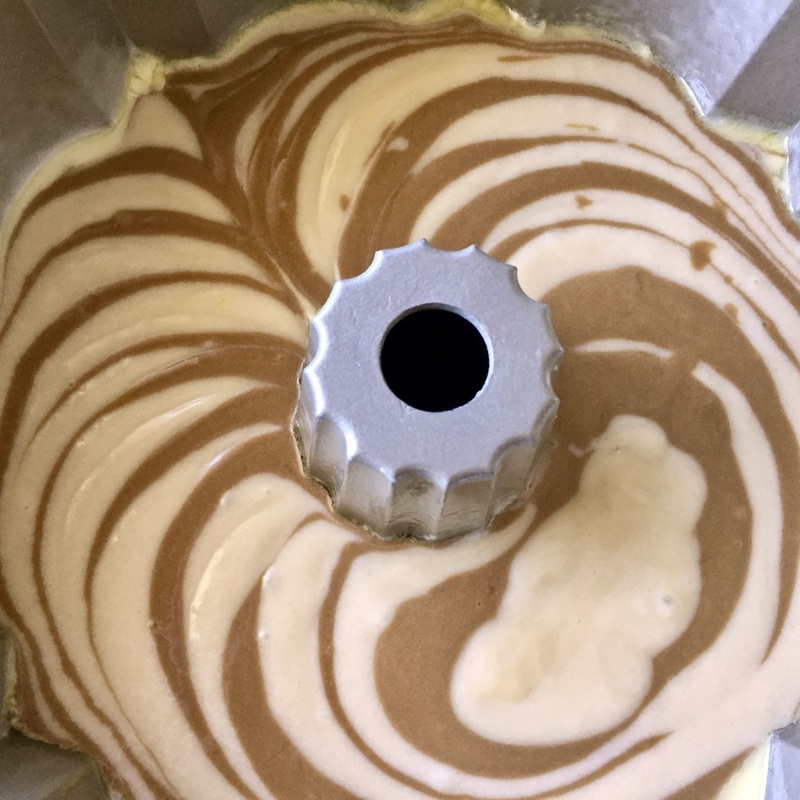 Then, using a separate scoop, drop a scoop of the espresso batter on top of the vanilla layer. Continue this alternating sequence until each batter bowl is empty. That is the Perfect Swirl, Felice! Not like a zebra but better. P.S. We SHOULD do a coffee theme! February 2019? Stacy I am all in for a coffee theme in Feb - it would be fun to turn coffee shop drinks into bundts. Love that zebra pattern swirl. The marble here is perfection and I would love to have one, Ok, two slices of this right now! It looks perfect!!! I love coffee flavor in cíes although I don’t Like coffee too much. I hardly have a cup of coffee but I Can have a huge piece of coffee cake lol!! !